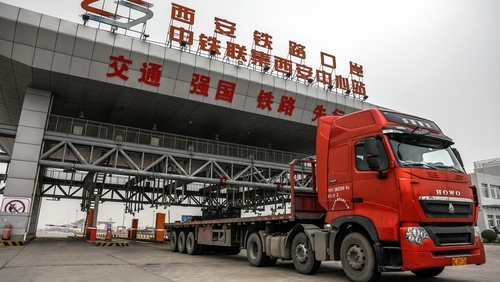 Invoking the spirit of the ancient Silk Road, China’s ambitious multi-billion-dollar infrastructure-investment plan, also known as Belt and Road, aims to connect Asia, Africa and Europe by building road, rail and maritime links. This week Italy became the first G7 nation - as well as EU founding nation - to sign up, in a significant boost to the project’s prestige. But the move left France and Germany disgruntled and French President Emmanuel Macron admonished Italy for breaking ranks. Macron said the "time of European naïveté" regarding China was over. "For many years," he said, "we had an uncoordinated approach and China took advantage of our divisions". Belt and Road is thought to be the brainchild of President Xi Jinping himself who flew to Rome to witness Italy becoming the 124th signatory nation, at the beginning of a six-day trip to Europe. The visit comes at a time when China is facing scepticism of its influence overseas, growing international criticism of its crackdown on the Uighur population in Xinjiang province - where over a million Muslims are believed to be interned in "re-education" camps - and a US-led campaign to have China’s telecommunications giant, Huawei, banned from Europe’s 5G networks over cyberespionage claims. China says Belt and Road nations will reap the economic benefits of mutual cooperation with China, the world’s largest second economy, delivering what Chinese officials like to call a "win-win" for each side. Italy’s signing bagged the economically-frail nation 29 deals, worth around €2.5bn. And there’s promise of more to come. But critics suggest Belt and Road is about indebting smaller nations, finding new markets for China’s overcapacity, securing strategic infrastructure facilities for Chinese interests abroad and promoting its authoritarian system of governance as an alternative to democracy. Detractors say the buzzwords "win-win" in practice mean China wins once - and then China wins again. Two of the deals inked in the China-Italy memorandum of understanding, will allow the China Communications Construction Company to develop and manage the two maritime ports of Genoa and Trieste - an important gateway to Europe. Alarm bells rang for some European allies who are concerned about China’s expansion into critical sectors like energy, ports, technology and agriculture. They warned that Italy could fall into a debt-trap, citing the Sri Lankan port of Hambantota which was ceded to Chinese control, when the country failed to repay its loans. The US was aghast with Italy’s decision and warned it against cosying up to America’s trade rival, which it accuses of unfair trade practices, forced technology transfer and IP theft. US Secretary of State, Mike Pompeo, who labelled China "a threat to our continued democracy" this week, said of Italy’s decision, "we’re saddened because we think the people of those countries ultimately lose". But the deal’s chief Italian architect shrugged off concerns saying the US had "nothing to worry about" and that it should concern itself with its own debt problems. Michele Geraci, undersecretary of state at the Italian Ministry of Economic Development also said that European critics were just "jealous" and predicted that other EU nations would be quick to follow in Italy’s footsteps. But the Silk Road signing met with as many dissenters inside the country as out. Italy’s nationalist deputy premier, Matteo Salvini, gave the Xi visit a wide berth and said he didn’t want "foreign companies colonising Italy". Meanwhile, an Italian journalist working for il Foglio, which is opposed to Italy’s participation in Belt and Road, published her account of a run-in with a Chinese official during Xi’s visit to Rome. The spokesperson for the Chinese Embassy reportedly told her to "stop saying bad things about China". Refusing to shake her hand, the paper reported, the official said, "I know very well who you are." While most foreign journalists working here in China will be familiar with pressure and intimidation from Chinese officials, the Italian paper took exception to it happening on home turf. "Since Italy is not China ... we have the full right to express ideas and criticisms," the paper wrote in an editorial. "If the spokesman of the Chinese embassy doesn't understand that," it went on, "then it will probably be necessary to ask a few more questions about these new friends of ours." President Xi Jinping’s next stop was Monaco where the royal family rolled out the red carpet. The tiny Principality, significantly, is planning to use China’s Huawei in its 5G network. Then the Chinese delegation moved on to the Elysée Palace in Paris to meet the French President Emmanuel Macron, who made good on his calls for a more united approach to China by inviting the German Chancellor Angela Merkel and European Commission head Jean-Claude Juncker for an impromptu mini-summit with President Xi. Amid the pomp and ceremony, the atmosphere was warm and friendly. But the EU allies reiterated their frustration with what they see as China’s unfair trade practices which restrict European companies from operating freely in China. While China has long enjoyed access to EU markets, they say, it is dragging its feet on its commitment to respond in kind. Belt and Road is "a very important project," Angela Merkel said. "We, as Europeans, want to play an active part," she added "and that must lead to a certain reciprocity, and we are still wrangling over that a bit." Mr Macron’s refusal to sign up to Belt and Road did not get in the way of big business deals struck for France. The leaders finalised a major contract estimated to be worth about €30bn to sell 300 Airbus airplanes to China. Lucrative deals on poultry exports and renewable energy were also agreed. Xi’s European tour was a chance for the Chinese leader to show close ties with a powerful trading bloc at a time when trade relations with the US have soured. Chinese state media took the opportunity to try and drive a wedge between Europe and the US. An editorial in the Global Times newspaper said that catering to US interests would hurt the EU and warned that Europe is too dependent on the US and NATO for security - a repost to Washington’s recent warning that it would be unable to share intelligence with countries using Huawei in their 5G networks. "The EU can compete with the US in economy and technology," the editorial added. "But some want to maintain the EU's secondary status by excluding China." "Suppressing China won't bring the EU a promising future," the paper warned. Nevertheless, concern remains in Europe that an EU member state’s decision to join the global initiative of an authoritarian superpower could undermine Europe’s collective commitment to a democratic, transparent and rules-based system of governance and the protection of individual rights. Already, other European beneficiaries of China’s largesse have shifted their position. Greece, which has received massive investment from China, vetoed an EU resolution at the UN in 2017, criticising the country's human rights record – the first time the EU failed to submit a joint statement. Previously, Greece and Hungary - another beneficiary of Chinese funds – prevented an EU move to condemn China’s actions in the South China Sea. As Italy sets off once again along the Silk Road, some worry its deepening friendship with China could herald another break in the European consensus and open the door to Chinese political influence in Europe.